Blog Home > Building and Construction > Cowboys at the Colosseum? 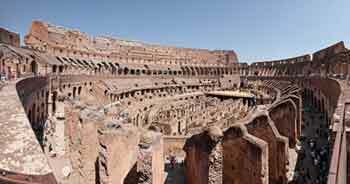 But concern has been raised over whether potential ‘cowboy builders’ are being used to restore the Colosseum. In December, Carla Tomasi of the Restorers Association of Italy, asked for the project to be looked into amid concerns of contractors being used with no specialist knowledge of working on such a site. But in late December a ruling by Italy’s Council of State was given for the work to continue, with the Director of the Colosseum stating that the workers were specialised in restoration and that the work was not being compromised. Warnings have been given though that although restoration and cleaning is needed, there is major concern about the underlying factors affecting the building, such as the traffic which flows around the site causing such major pollution. It is hoped that at some point in the future a subway could be built and traffic stopped on the roads surrounding the Colosseum. Stay safe in 2012 – get some new habits!